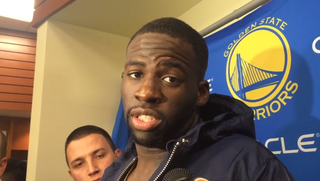 The Warriors beat the Clippers 106-98 today, but the most intriguing part of the game happened after the final buzzer, when Dahntay Jones bumped Draymond Green during Green's postgame interview. I think he wanted a reaction from me, but he don't play, so, you know, me getting suspended and him getting suspended, it's different. You know, when you don't play, that's probably his role on that team. So, I've had that role once before in my career, a couple years ago, but I can't afford to, you know, feed into that, where I get into it with him after the game, and, you know, get fined, get suspended, and hurt my team when, you know, if he gets suspended, they may not even notice. Jones and Green aren't from the same college or state, and they haven't played on the same NBA team. So, this doesn't seem like a friendly inside joke. Looking at the box score, Green led his team with 23 points. Jones didn't play due to a coach's decision.